By buying this product you can collect up to 18 loyalty points. Your cart will total 18 loyalty points that can be converted into a voucher of 5,40 €. EQUISPORT PERFORMANCE is a highly concentrated multi-Vitamins, minerals and amino acids supplement for use with grain horse rations. 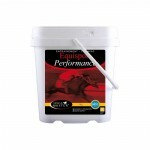 Ideally supplementation for performance horses during hard training and racing.